In the early 1890’s the Welsh Education Authorities under the Welsh Intermediate Act of 1889 decided to set up intermediate schools in all areas of Wales which were able to support them. 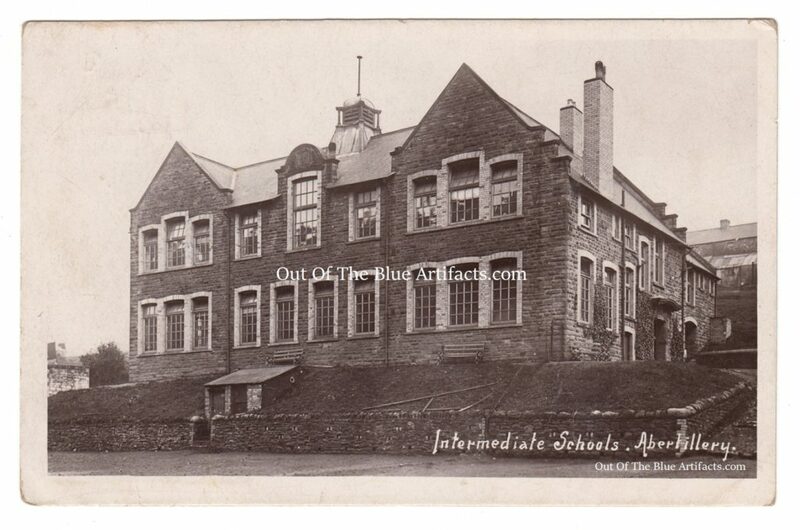 On Thursday 24th February 1892 the need of an intermediate school for Abertillery was first raised. A letter was read from the clerk to the county council that the education committee had provisionally settled that an intermediate school to provide accommodation for 70 boys and 50 girls be placed at Abertillery. On Thursday 3rd March 1892 at an ordinary monthly meeting of the Abertillery Local Board at the Board-Room Blaina, consisting of the following members – Mr G. B. Hammond (Chairman); Mr H. J. Phillips; Mr Joseph Wallace; Mr T. Robins; Mr J. Gregory; Mr J. T. Dawson; Mr W. Jordan; Mr James McBean (Surveyor) and Mr John A. Shepard (Clerk): It was stated to initiate funding for an intermediate school and several people had been approached for subscriptions. On Wednesday 9th March 1892 a meeting was held at the National Schools, Abertillery to consider matters in connection with an intermediate school. The meeting consisted of the following members – Mr Samuel Nathan Jones (Chairman); Mr L. R. Rogers; Mr Titus Phillips; Mr W. B. Harrison; Mr T. Robins; Mr James McBean; Mr William Jordan; Mt T. Bevan; Mr Joseph Wallace; Rev J. F. Rees (Vicar); Rev T. Griffiths; Rev T. T. Evans Mr D. Hussey and Mr C. W. Carpenter: The chairman stated that it was necessary for them to obtain £600 and a site to erect an intermediate school, they had a lot of support from Nantyglo, Blaina, Aberbeeg and Crumlin and that Messrs Webb Bros were mentioned as persons likely to give land for a site. On Wednesday 23rd March 1892 it was announced that a deputation was in talks with Messrs Webb Bros over a acre of land given by them to the council for the proposed site of an intermediate school. On Monday 16th May 1892 at a meeting held at the National Schools, Abertillery, in support of an intermediate school, Mr Titus Phillips was appointed chairman. Rev T. Griffiths reported he had secured a promise from Mr Edward Jones (Partridge, Jones & Co) Snatchwood, that he would give a donation. Also the miners from Six Bells and Penybont Colliery would subscribe 1s. shilling each. Rev T. T. Rees said Cwmtillery Colliery was in dispute and there was little chance of the miners there helping at the moment. Mr Gunter had approached the tin works staff and they had yet to have a meeting. Mr A. C. Goddard of the Capital and Counties Bank was asked to take the post of treasurer. They were awaiting a response from Messrs Lancaster. During the meeting a large committee was formed consisting of members from all denominations and works, as follows – Drs Williams; D. C. Muir; J. Kerr Muir; Sullivan and Sargent: Mr T. Bevan; E. J. Williams; J. T. Baker; T. W. Allen, members of the Chamber Of Trade and the following representatives of the workmen – Cwmtillery, Mr Alf Hill; Mr E. Harris; Mr G. Dauncey; Mr G. Purnell; Mr D. Sage; Mr E. Barnes Mr John Evans (Blacksmith); Mr Tom Price; Mr Kelson; Mr D. Jones and Mr F. W. T. Clarke: Penybont, Mr T. Jones; Mr T. Richards; Mr J. T. Collier; Mr W. Treharne; Mr W. Spencer; Mr J. Harris; Mr A. Frowen; Mr Mark Ashley; Mr T. Price and Mr T. James: Messrs Robin’s Coal Level, Mr T. Smith; Mr A. Withers and Mr C. Brittain: The Cwmnanty Coal Level, Mr Jesse Daggar and Mr Henry Rees: The Tinworks, Mr Jonah Jenkins; Mr James Jenkins; Mr D. Smith; Mr John Winmill; Mr T. Lewis; Mr W. Rosser; Mr W. Wheeler; Mr A. Jones; Mr W. Prosser; Mr John James and Mr Job Gilligan: It was also considered that a committee of ladies be formed. At this time the Co-operative staff and management were large contributors towards the proposed intermediate school. On Thursday 8th November 1894 the first meeting of the newly appointed managers of the Intermediate Education Scheme was held at the Local Board Offices, Abertillery. It consisted of the following members – Mr Titus Phillips J.P. (Chairman); Mr John Dakers (Lancaster Co); Mrs T. Phillips; Mrs W. Thomas; Mr S. N. Jones; Mr W. Thomas; Mr W. Y. Hobkirk; Mr G. R. Webb and Rev T. Griffiths (Clerk): The clerk reported that with reference to the site of an intermediate school, he accompanied Mr G. R. Webb to the site between the tin works feeder and the River Ebbw in the valley and produced a plan of that site which they were offering free as a site for the school. The committee expressed their sorrow at the fact that site had been offered and said that they didn’t want the new school being in a hollow in the valley but preferred it to be on the hill. Mr Webb said that all the land had been rented but he could see what he could do in the matter and let the committee know in weeks time. In February 1895 the Cwmtillery colliers were asked to donate to the costs of building a new school and they promised 1d. per month each for 12 months on condition a labour representative be opted onto the board. It was agreed. On Thursday 2nd May 1895 at a meeting held at the Tillery Hall, Abertillery in connection with a intermediate school Abertillery, the following members were present – Rev T. Griffith; Mr S. N. Jones J.P.; Mr Titus Phillips J.P.; Mr W. Thomas; Mr W. B. Harrison; Mr Arthur Tilney; Mr W. P. Thomas; Mr Alfred Hill; Mr W. C. Cowdrey and Rev T. T. Evans: The chairman pointed out that a site for the school had been obtained and secured. Messrs J. R. and T. A. Webb had granted them the site between the Rose Heyworth Cottages and the Kings Head which was satisfactory. He also stated that there was a promise of £400 to come with £240 in the bank and that the sum of £600 was necessary. In the May and June of 1895 reports of the donations towards the building an intermediate school were shown, the Blaina colliers had donated. Mr Powell of the Powell’s Tillery Collieries gave £100. Public houses collected the sum of £45. Mr Bostock’s Circus gave the proceeds of his show at Abertillery £10. 8s. 0d. to the fund. 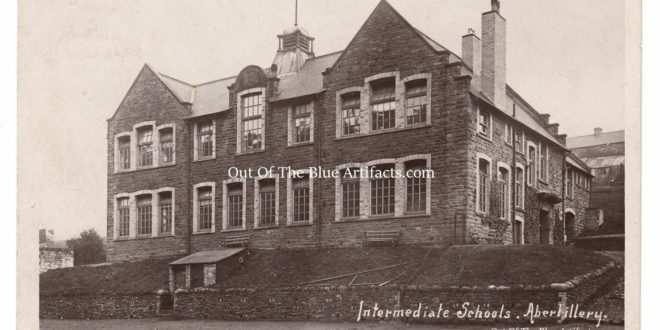 On May 24th 1896 advertisements were placed in the newspapers for applications for the posts of Headmaster and Headmistress at the Abertillery Intermediate School. It was stated the salaries were £150 and with a capitation grant of £120 respectively. The Initial Opening of an Intermediate School at the Oddfellows Hall 1896-1898. On Tuesday 22nd September 1896 an Intermediate School opened in the Oddfellows Hall and at King Street Baptists Vestry, Abertillery. These premises were only temporary until a new school was built. The headmaster was Mr W. D. Lewis Evans M.A. London, he appointed Mr F. C. Carey B.S.c London A.R.C.S. as assistant master with Miss Edith M. Ewart M.A. Victoria, as the post of headmistress. The school was the first to start in the county with 60 scholars attending, about 30 pupils in each premises, the boys were taught at the Oddfellows Hall and the girls at the King Street Vestry. The governors gave praise to the Rev T. Griffith whose help and labours brought the scheme success. In October 1897 Mr W. D. Lewis Evans, the headmaster of the Intermediate School, Abertillery at the Oddfellows Hall, gave his first annual report on the school. In it he states that during the first term the number of pupils were 78 (39 boys and 39 girls). Second term 110 (57 boys and 53 girls). Last term there were 91 (48 boys and 53 girls). Children who attended came from Nantyglo, Blaina, Aberillery, Aberbeeg and a few children from beyond the area. With regard to the recent Oxford local examination, Abertillery stood 3rd with Carnarvon and Wrexham being in advance to the extent of just a few more passes. From the time the Intermediate School had been initiated at the Oddfellows Hall and the King Street Baptists Vestry, Abertillery, the authorities were working to get the institution its own purpose built school. Land had been generously given by Messrs Webb’s of Aberbeeg and tenders had been invited by local builders to construct the new purpose built Abertillery Intermediate School. The contractor was Mr David Lewis of Aberbeeg. The architect was Messrs Swash & Bain. During the time the Intermediate School was housed at the Oddfellows Hall and King Street Vestry, Abertillery, the new site and building at Clyn Mawr had advanced and by the end of 1897 the new Abertillery Intermediate School building had been completed. The New Intermediate School 1898-1911. 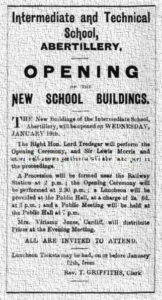 On Wednesday 19th January 1898 the new Abertillery Intermediate School building, Abertillery (as seen in the main featured image above) was officially opened. The official ceremony consisted of a public procession from the station to the school, the streets were lined with people who battled the bad weather conditions. The Right Honourable Lord Tredegar and Sir Lewis Morris headed the procession with the Tillery Band leading the way. Once at the school Lord Tredegar was handed the keys to the school by Mr S. N. Jones who unlocked the doors and the party entered. It was said that Abertillery were the pioneers of intermediate education in the country. The luncheon was held at the Bush Hotel, Abertillery and catered by Messrs Tovell, after many speeches entertainment was provided by Miss C. Tilney, Miss Bundred and Mr A. Williams. The school was of two storey’s, the first floor was classroom accommodation for 40 girls, exclusive of classroom for teaching cookery which was provided by raising tiers of seats and the usual apparatus, and the assembly hall which was centrally placed and would accommodate a good number of persons. An arrangement of revolving shutters an adjoining classroom could be used in conjunction with the assembly hall thus providing increased accommodation when needed. The corridors were painted with stained wood dadoes. The internal roof had open timber framing with carved and moulded brackets. The boys department occupied the ground floor with ample classroom space for 60 pupils and private rooms. The floors were sound and fire proof. The contract along with retaining walls came to 32,430. The external wall were built with hammer-polled local stone walling and dressings being Bath stone and Ebbw Vale buff bricks. The new school building was insured at a cost of £1,500 and the furnishings at a cost of £250. The total costs of the new school was £2,429 with the architects bill being £162. The school was of the “dual” kind, with boys and girls departments, the governors had the power to arrange for mixed classes in any subject. The district served by the Abertillery Intermediate School were Blaina, Abertillery, Llanhilleth and Crumlin and with many pupils from beyond and outside the area. In addition to the scholarships offered by the governors, several scholarships were given by the Abertillery tradesmen and the Blaina Co-Operative Society. Subjects taught – Arithmetic, geography, English history, scripture, history, English grammar, composition and literature, drawing, mathematics, Latin, French, Welsh, chemistry, mechanics, mensuration, book-keeping, shorthand and typewriting, music and drill. For boys only – Mining, working with wood and iron, geology and physiography. For girls only – Laundry work, cookery, dressmaking and the laws of health. Tuition Fees – 15s. per term, payable in advance. Books and stationary provided to the pupils free of charge. The school week was from Monday, Tuesday, half-day Wednesday, Thursday, Friday and Saturday, no school on Sunday. Mr T. Griffiths, Castle Street, Abertillery. On Monday 21st March 1898 the chief inspector made a report on the Intermediate School, Abertillery as follows – Since his last inspection he was pleased to see the school had been moved to a permanent building. The revolving shutters were unsatisfactory and needed to be replaced. The laboratory was excellent and equal to any seen at the top schools. The play-ground complied with the regulations. The old school had four teachers, he was glad to see they now had six. Pupils attendance was satisfactory with the guidelines being 95 per cent. The age limit was under 18 years of age. Dining facilities there were 17 boys and 20 girls dining at the school, it was meant to give the pupils an education and a social life. Discipline was seen as very high standard and the pupils were very happy and bright. Teaching it was seen as being of the highest standard. On Thursday 8th September 1898 a meeting of the governors of the school consisting of the following members – Mr S. N. Jones; Mr E. J. Williams; Mr W. J. Hobkirk; Mr W. Treharne; Mr W. B. Harrison; Mr T. Allen; Mr W. Thomas; Mrs Caleb Lewis and Mrs Isaac Lewis, with Rev T. Griffiths: The governors appointed Mrs Mary Ann Gregory of Abertillery as caretaker. The Headmaster Mr W. D. Lewis-Evans had appointed Mr T. W. Fagan M.A. as assistant master. It was also arranged that there should be no school on Saturdays and all day on Wednesday’s from now on. In September 1898 Abertillery Intermediate School was reported as coming top of the list of passes in Wales, the list was as follows – Abertillery 1 Honour, 14 First Class, 8 Second Class, 2 Distinctions, Total 23. followed by Mold, Wrexham and Bala. The two pupils who obtained distinctions were Masters W. E. Rees of Blaina (Drawing) and E. R. Thomas of Aberbeeg (History). The Old Tyleryans Association was formed in March 1901. It began as an association to keep a bond of union amongst the old pupils of the Abertillery Intermediate School. Mr W. D. Lewis Evans the headmaster was the president and Mr A. W. Box of Oak Street, Abertillery was honorary secretary of the new society. Wednesday 27th March 1901 the first meeting of the Old Tyleryans association was held at the Intermediate School, Abertillery. Over 60 members attended, Mr W. D. Lewis Evans presided, he gave the opening address and welcomed all those present. Miss Louise Thomas gave a pianoforte solo after which various games were indulged in. Refreshments were handed round followed by two songs – “Spring is Coming” by Miss Louise Thomas and “Lakes of Killarney” by Miss E. Bundred. After more games and dancing the meeting was brought to a close by the singing of “Old Lang Syne”. It was announced that the next meeting was to be held in a months time. In 1909 the Intermediate School, Abertillery was getting too small for the expanding community and needed to be enlarged and updated. In July 1909 tenders were invited for the major expansion of the building, plans and specifications could be obtained from Mr R. L. Roberts the architect of Abercarn at a cost of £2. 2s. 0d. which was returned on receipt of a bone-fide tender. The tender of Mr J. Morgan of Blaenavon was accepted. In February 1911 the Headmaster Mr W. D. Lewis Evans M.A., gave his annual report on the school year ending 1910 at the Gymnasium Hall, Abertillery during the prize distribution event in connection with the school. This was the last report on the old school prior to the new extensions being constructed. The following gentlemen were present – Mr J. Snelgrove (Chairman); Mr Edgar Jones M.P. ; Alderman W. Thomas J.P. and Mrs Thomas; Councillor W. B. Harrison J.P.; Councillor E. Jones Williams; Rev S. Jones and Rev T. Gray Davies, with members of the school staff and other educationalists. Within the headmaster’s annual report of the year of 1910 it stated there were 106 boys and 167 girls registered. The school was composed of 13 Forms as follows – Form 1a, Form 1b, Form 2a, Form 2b, Form 3a, Form 3b, Form 4a, Form 4b, Form 5a, Form 5b, Form 6a, Form 6b and Form 6c. The ages of the pupils were – Under 11s… 2 boys. Between 11 and 12…6 boys 4 girls. Between 12 and 13…23 boys and 32 girls. Between 13 and 14…30 boys and 41 girls. Between 14 and 15…18 boys and 26 girls. Between 15 and 16…9 boys and 25 girls. Between 16 and 17…9 boys and 15 girls. Between 17 and 18…7 boys and 10 girls. Between 18 and 19… 3 boys and 6 girls and over 19…7 girls. There were 114 fee-paying pupils. 46 Governors Scholarship holders. 16 Abertillery Education Committee Scholarship holders. 8 Blaina Stores Scholarship holders. 4 Cwmtillery Scholarship holders. 1 Thomas Bevan Scholarship holder. 1 International Scholarship holder. 16 Maintenance Allowance holders. 35 Probitioner Scholarship holders. 1 County Burser. 4 Student Teachers and 27 Pupil Teachers. It was said that during the session (1909-10) 111 pupils had left the Abertillery Intermediate School with 7 pupils entering colleges, 23 became teachers, 25 shop assistants, 9 clerks and 7 miners. Others left to enter into professions such as fitting, nursing, plumbing and surveying. The work on the new extension began in February, was built by the September, furnished and later officially opened on Wednesday 20th December 1911. The Contractor and Architect for the New Extension. The contractor was Mr John Morgan from Blaenavon. The school was remodelled by Mr R. L. Roberts the architect of Abercarn. The clerk of the works was Mr C. Locke of 136 Caerleon Road, Newport. Following is a Link to – The History of the Intermediate School. Notes of Interest – Mr David Lewis. Mr David Lewis the contractor who constructed the Intermediate School, Abertillery was born 14th May 1871 at Llanhilleth. His father was Mr Lewis Lewis of Rose Cottage, Llanhilleth, one time landlord of the Hanbury Arms, Aberbeeg, Union Inn, Llanhilleth and the Ivorites Arms Aberbeeg, his mother was Mrs Mary Lewis. Mrs Lewis second marriage was to Mr Thomas Phillips of Maescynew Farm, Llanhilleth. Mr David Phillips was educated at the Aberbeeg Schools and was later apprenticed to the building trade at Newbridge under the supervision of Mr Charles F. Morgan and later at Newport to receive further training in the building trade. He commenced business in his own right in 1891, his first workshop was erected at Hafodarthan Road and as his business expanded he acquired the site of the old Mill near Glandwr. Mr David Lewis was called the “Builder of Llanhilleth and Aberbeeg” as he had erected the Llanhilleth Hotel, Llanhilleth Workmens Institute, the new Hanbury Hotel, the Llanhilleth Playhouse Cinema, the Glandwr and Commercial Road Baptist Chapels, the Zion Congregational Church, the Wesleyan Chapel, the Lower Council Schools and the Brynhyfryd Schools, Llanhilleth. Mr David Lewis married Miss Lewis, the daughter of John and Margaret Lewis of Gilfach Farm near the Travellers Rest Inn. Aberbeeg. Mr Lewis died from pneumonia in 1914, he left a wife and two children Jack and Harry Lewis. They had an elder daughter Miss Ethel Lewis, sadly deceased.